WHENEVER we write about technical problems with the EPO we foresee it adopting the low standards of the USPTO (in terms of examination), which may also mean software patents in Europe. One emerging tactic for bringing about software patents is FRAND, which was mentioned in the previous post. Another is the UPC, which just like TPP threatens to bring software patents into Europe (the technicalities of this process were explained here many times before, including yesterday). This is similar to PTAB in the US (inter parte reviews), but this overlooks the fact that this process is expensive and laborious. Small patent developers, for example, have neither the time/money nor motivation to pursue such a process. This means that this status quo remains heavily biased and thoroughly tilted against SMEs. Moreover, consider the UPC’s likely impact on boards; they could soon be rendered obsolete. But this does not actually imply ratification and the press release tells an outright lie, as was the case with TPP and TTIP. This mirrors the recent trend of so-called ‘trade’ deals, which are shrouded in secrecy and benefit from misleading press coverage (if any at all). We don’t truly think so, but nevertheless, it sure seems like even MIP readers admit that the EPO’s claims about UPC being good for SMEs are lies. 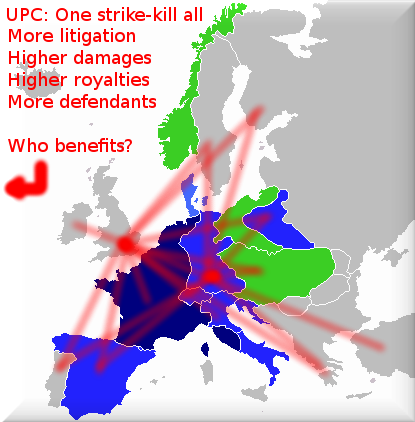 “The UPC will employ” is wrong. The UPC, if it ever became a reality at all, would do all sorts of things, but given the atmosphere of propaganda (see the SME propaganda above), one shouldn’t believe anything at all. Watch how US patent lawyers hold an event about the UPC in the US. They seem to know who the UPC is for and it’s not for Europeans. SMEs from Europe won’t fly to the US to attend such a conference, one of several such US conferences sponsored by the EPO's PR firm (which just ‘happens’ to be a US-based firm).